The benefits of honey are widely celebrated in ancient texts. From these, it is clear that honey has been used as a nutritious food source and a natural healing remedy by civilizations throughout history. It has even been reported that Julius Caesar, for a time, accepted honey’s use as currency that was substituted for gold used to pay taxes. Again, in the 11th century, historians report that German citizens paid property taxes with honey. Why has this food remained so popular throughout the ages? Most will agree that it offers a very satisfying taste, but beyond this, honey nutrition facts show that it is immensely helpful in obtaining optimal health. So helpful, in fact, that Hippocrates, who is widely considered to be the first practitioner of what we call western medicine, used the benefits of honey in a variety of his treatments. Using it as an expectorant, Hippocrates believed that honey caused heat that was also useful in cleaning wounds, sores and ulcers. Further, he promoted the idea that honey was helpful in preserving a healthy complexion. Later, noted Greek philosopher, botanist, physician and pharmacist, Dioscorides, who is also credited for authoring one of the oldest known journals of medicine, cited honey nutrition as being one of the best remedies available for a variety of different ailments. Many benefits of honey! 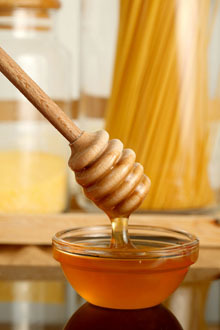 Raw honey contains trace amounts of resins, which are also found in propolis (also referred to as “bee glue”). It is this substance that the female worker bees use in sealing the colony’s hive and protecting it from bacteria, as well as a variety of different fungi and viruses, which may otherwise infect the colony. This substance is made of a combination of the honeybee’s own secretions and plant resins. Along with this important phytonutrient, honey nutritional facts also reveal that it has properties that are effective in fighting cancer and other tumors. Children under twelve months should not be given honey or products containing honey due to Clostridium botulinum spores that may be contained in its substance. These spores are known to cause a life-threatening disease known as infant botulism, which can also cause paralysis in children who survive its effects. Depending on the environment where honey is harvested, pesticides, toxic metals and antibiotics may also be present in honey. For this reason, it is recommended that individuals only consume organic honey secured by a safe, reputable vendor or manufacturer. With a delicious sweet taste that rivals sugar, but with fewer calories, this delectable brown liquid treat is as healthy as it is tasty. Those intent on achieving the highest levels of dietary health routinely rely upon the benefits of honey in place of processed sugars and artificial sweeteners for its flavoring, as well as for its miraculous health properties.